When I first heard Emily Kinney was making a guest appearance on The Flash I was very excited. The fan favorite actress had just completed her run on AMC's hit zombie apocalypse show, The Walking Dead, and she was cast to play the villain Bug-Eyed Bandit in the episode, "All Star Team U." The writers even gender-swapped the traditionally male character to cast her. Sadly, we got very little Kinney and even less character development. It was disappointing but not the only problem with the episode. Don't get me wrong, an uneven episode of The Flash is still better than most television but there's been this lingering issue that began as a minor annoyance and has grown into larger problem that was clearly on display Tuesday night. "Everybody but Iris," is what Eddie tells Barry when he finds out that the visitors from Starling City, Felicity Smoak and Ray Palmer, also know Barry's super alter ego. And that in a nutshell is the problem. They keep repeating how they're protecting her by keeping her in the dark but she's slowly been depicted as a fool by being the only one kept from the truth. The deception is starting to take a toll on Iris and Eddie's relationship because even though Eddie was just told (why exactly Barry and Joe felt the need to tell Eddie is still a mystery to me) he's having a hard time continuing to lie to her. She senses something is wrong and is clearly unhappy about Eddie's weird behavior. The brewing conflict blows up during a double date dinner with Felicity and Ray.Yet, Eddie never should have been put in this position. Yes, with Barry out as the Flash it makes his collaboration with Joe and Eddie more efficient in fighting crime as we see with a very clever car chase and breaking up a jewel heist but the "don't tell Iris" subplot has surfaced to the top and it's weighing the show down like an anchor. The worst part is that the consternation of the story-line is completely unnecessary. Iris should have been told by now. She isn't any safer snooping around for the truth surrounding Harrison Wells as her colleague Mason Bridge now "living in Brazil" found out. Besides, we know she's going to find out eventually if comic book canon matters at all. She not only finds out but marries Barry at one point. So the writers need to stop insulting Iris' intelligence as well as the audience's. If details of the episode's villain in this review seem like an afterthought it reflects the way she was treated on the show. Brie Larvin is a vengeful robotics engineer out to kill those who stole her designs and fired her. She uses hundreds of robotic poisonous bees to carry out her crimes. And that's about all you need to know because that's basically all we get. Early on, when the show premiered they cast obscure villains that weren't very formidable as sparring partners for the newly powered speedster, Barry Allen. One-dimensional characters who spent most of their time twirling their metaphoric mustaches and serving as fodder for our hero. Except for one brief scene where Brie and Felicity face-off, keyboard versus keyboard, where Felicity quips she's never had a nemesis before, her appearance is mostly meaningless. Perhaps it was a device to get Wells' former colleague, Dr. Tina McGee (Amanda Pays) at Mercury Labs where Larvin worked, to reveal to Barry that Wells changed into a "different person" after his car accident. A bit of information that helps solidify Barry's suspicions about Wells' nefarious background and the possibility of his involvement in his mother's death. After some debate, Barry and Joe decide to bring in Cisco and Caitlin in on their investigation of Wells. The most unconvinced is Caitlin but there's no doubt in Cisco's mind as he began to have dreams and flashbacks of discovering Wells to be the Reverse Flash and being killed by him. Just as it happened before Barry's time jump in episode 15, 'Out of Time. 'It all seems like a prelude to finally revealing Wells devious intentions. With Felicity and Ray in town to get some help with the ATOM armored suit from STAR Labs, the show finds its humor and levity amid the ridiculous relationship turmoil of Iris and Eddie and villain of the week. Ray and Cisco especially have great scientific nerd chemistry while working on the suit. One of the fantastic things about The Flash is the coolness given to science and technology. So many intelligent and charismatic characters that make being smart something to celebrate. They make science way more attractive than anything 'The Big Bang Theory' has ever done. It's commendable that the show examined something as fundamental as honesty and communication between friends, lovers and colleagues but it didn't hide from the episode being a placeholder for better things to come. It moved the season forward only by inches but overall it was still an entertaining hour of silliness and camaraderie. 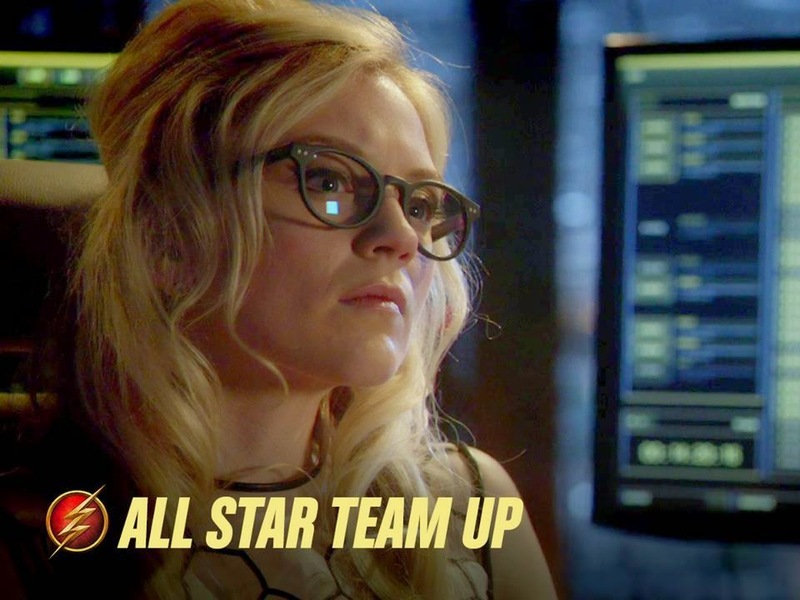 We know there's more exciting things to come but 'All Star Team Up' still earns a solid B-. JOE AND CISCO TRAVEL TO STARLING CITY FOR ANSWERS ABOUT DR. WELLS — Joe(Jesse L. Martin) and Cisco (Carlos Valdes) head to Starling City to continue their investigation ofDr. Wells (Tom Cavanagh). While in town, the duo enlists the help of Captain Lance (Paul Blackthorne), and Cisco meets the Black Canary (Katie Cassidy), who asks him for afavor. Meanwhile, back in Central City, Barry (Grant Gustin) races to catch a meta-human named Hannibal Bates (guest star Martin Novotny) who can transform himself into every person hetouches – which includes Eddie (Rick Cosnett), Iris (Candice Patton), Caitlin (Danielle Panabaker)and even The Flash. Wendey Stanzler directed the episode written by Ray Utarnachitt & Cortney Norris.